Located on a dramatic bay front in Sarasota, New College of Florida is a 140-acre residential honors academic institution, well known for its liberal arts programs, student-directed study programs and low student-to-faculty ratio. 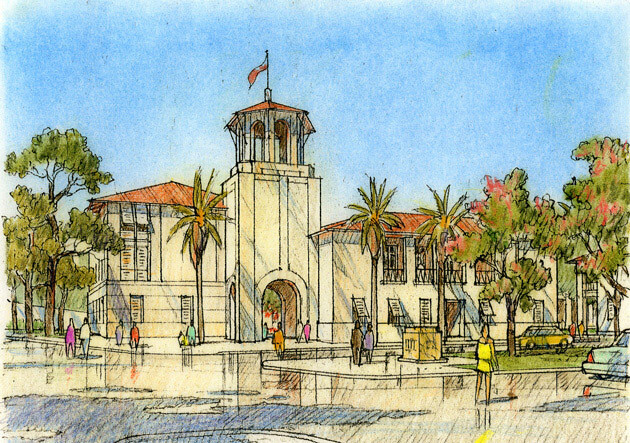 The College is over forty years old and its recent departure from the Florida State University system presented an opportunity to assess its programmatic needs to express its unique identity and, through design, to reestablish a connection between its relatively separated campus precincts in a place-specific and highly sustainable design. In response to these needs, the master plan by Moule & Polyzoides/FFS Architects includes over one million square feet of new building area. New academic quadrangles and sustainable landscapes are introduced throughout the entire plan. The existing landscape at the bay front is regenerated and a new mixed-use center is located between the College and the surrounding neighborhood in a typical town-gown pattern. Traffic calming and new pedestrian and bicycle paths connect all parts of the campus, creating a more pedestrian-friendly campus. The plan celebrates the College’s unique academic approach, fosters social interaction and reinforces the institution’s strong sense of academic community.